Lying on Indochina Peninsula, Vietnam shares the borders with three neighbor countries and has a long coastline of more than 3,000 kilometers long. Thus, it's easy to get to Vietnam by airway by waterway and by road. 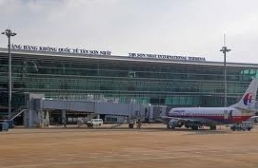 Airway is the best way to get to Vietnam that is easy and save your time with eight International Airports. Travelers can also get to Vietnam by roadway with two options by train or by bus. Beside the number of travelers come to Vietnam by waterway is continuously rising. And, please do not forget to bring your passport with you.